ContractStore has collaborated with Lawpack to launch a new guide: the Business Terms and Conditions e-kit. There is also advice on debt recovery and a range of other subjects including how to get the best out of your lawyer. The e-kit contains a number of sample documents including Terms & Conditions for supplying goods and services. 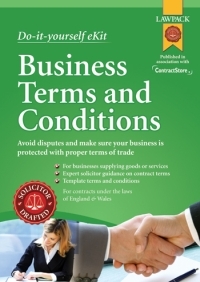 Written by three solicitors who specialize in commercial law, including ContractStore’s founder, Giles Dixon, this invaluable guide is priced at £19.99 (£17.50 plus VAT). This entry was posted in Running an SME and tagged business start-up, business terms, starting a, T&Cs, terms & conditions. Bookmark the permalink. Political language is designed to make lies sound truthful and murder respectable, and give an appearance of solidity to pure wind.